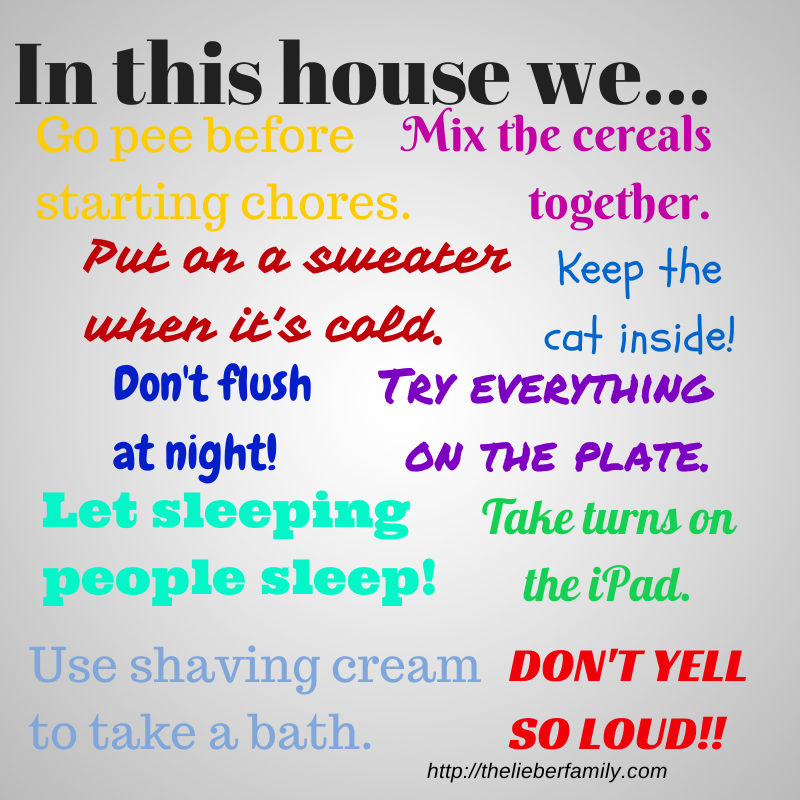 The Liebers: House Rules...Lieber Style! Have you guys heard of Pinterest? Haha! Of course you have! Think of all the world's problems that could have been solved last year if we hadn't all be so engrossed in pictures of themed birthday parties, new fabulous workouts, and funny collections of e-cards and Ryan Gosling memes. Not that there's anything wrong with those things (especially Ryan Gosling memes). I enjoy Pinterest just as much as the rest of you. OK, slightly less but just because I am trying to figure out Instagram and also because Pinterest scares me a little bit. Everything there just seems so Pinterest-y! You know? So perfect! And we all know I'm not perfect. Very, very far from it! Please don't misunderstand me. I think these signs are really cute. I even aspire to being able to enforce those rules one day in my own house. It's just that, for now, I'm setting my standards a little lower. I made my own sign for my family, with rules that we actually go by in our house. Without fail, whenever we get home from the store and start to put away groceries, Frances has to go to the bathroom. And then right as we are finishing, she comes back. This trait is hereditary and if I can get my mom or dad to comment here they will tell you that my brother Alan did this all the time growing up!! The boys, especially, like mixing two (or three) different cereals together. It's a battle that I don't feel like fighting in the morning, and actually it's probably a good thing, because they usually mix something sugary (Cinnamon Toast Crunch) with something non-sugary (Cheerios or "Crispy Hexagons" since we buy the generics of some cereals). I learned the sweater thing from my dad. Or maybe Calvin's (of Calvin & Hobbes) parents. It builds character, right? Our cat likes to try to escape. Pair that with kids who were apparently born in a barn, and you will understand why I am constantly yelling for the to keep the cat inside! I prefer my kids to clean their plates. I hate wasting food. That being said, I don't put very much on their plates to begin with. As my grandmother always said, "You can always take more, but you can't take less. So I ask the kids to try a bite of everything. Actually, I just ask Benjamin. Frances and Henry eat almost everything I put in front of them. This sleeping rule is the hardest rule we are working on. It mostly applies to us parents on Saturday mornings, but occasionally a child will sleep in, or even nap, and they have the right to sleep if they want to. I probably don't need to explain the iPad sharing, do I? This one was suggested to me by our babysitter. One evening when I was out, she gave the boys a bath and got after Henry because he was trying to use my shaving cream to wash himself. She thought he was trying to pull one over on her. Now she knows that they are allowed to soap up with it and rinse off. Mainly because it's fun, but also because they get clean that way. The last one is another that doesn't need explaining, RIGHT!?! 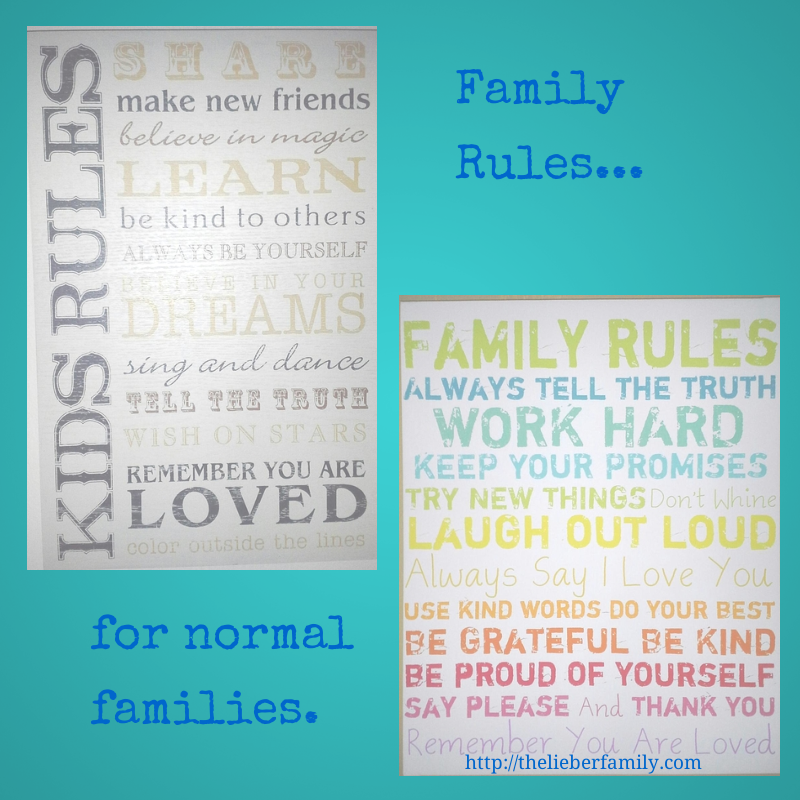 Do you have any quirky house rules in your house? It's okay to share them in the comments!